Restaurants are always opening in London and many close only months later. But you can tell which are the really good ones… They’re the ones that have been around for years and are still packed to the rafters most nights. 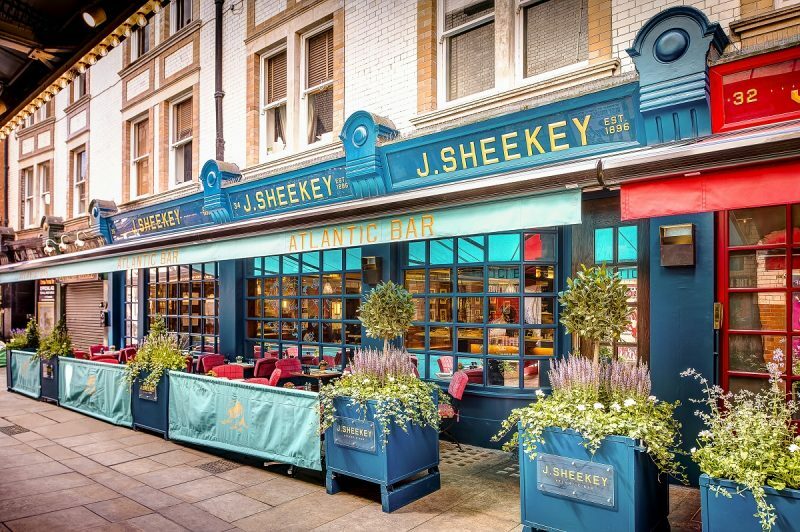 J Sheekey is one such London institution having held it’s spot in Covent Garden for over 100 years. When I mentioned to friends I was visiting with my husband, they all had a story about how it was their mums, dads, grandparents, friends favourite restaurant! Each wanting to sharing a fabulous story about their visit or telling me what I needed to order! Serving the best seafood in town, this restaurant is part of the Caprice Group, and quite frankly their restaurants always deliver and have done for years. Recognisable by its vibrant canopies and centuries-old signage, it is a pocket of old worldly sophistication amid the chaotic razzamataz of the West End. Next door to J Sheekey, J Sheekey Atlantic Bar, is instantly recognisable from the outside design in shimmering turquoise and vibrant raspberry colours. Seating approximately 50, the mood-lit Atlantic Bar was subtly spruced up in 2016 and features a central, marble-topped oyster bar and bustling backroom of tables. Renowned cartoonist Kipper Williams produced a charming series of illustrations for the restaurant, which line the walls. Open daily from midday until late, food is seasonal, delicious and affordable. Appealing to seafood enthusiasts, but neglecting no-one, the menu offers small sharing plates of fish, shellfish, salads and game, not to mention with the very theatrical Plateau de Fruits de Mer. The team is passionate and knowledgeable, serving from an open kitchen as and when the dishes are cooked. Sadly the British weather meant we were unable to enjoy the summer terrace, but we were instead quickly seated on high stools at the bar. While perusing the menu we ordered the Sheekey’s take on an Aperol Spritz. The Aperol Spritz is made with Prosecco and Aperol with a touch of Beefeater, Agave syrup, Lime and Bitters. It was a delightful start to our evening. The sharing-plate style menu at J Sheekey Atlantic Bar means that you are able to sample more variety from the menu, which is such a treat – especially when the fish is so tasty. So after finally making a decision about whether to have red or white wine (I won, we ordered red), we decided to start with three dishes and a couple of sides to share. My two favourites were the Seared Octopus plated with roasted chorizo, padron peppers and capers and the Moroccan Spiced Tiger Prawns served with lemon yoghurt and pistachio. Both were visually stimulating with exotic flavour combinations – the latter boasting particular aromatics from cumin and coriander, maintaining succulent the flesh of the crustacean. Without even trying we then ordered two slightly bigger dishes, which felt more like our mains. The shrimp and scallop burger, and the fish stew, which was probably the best dish of the evening for me. The atmosphere of the restaurant was relaxed and people were in and out all night – some staying longer like us and some just popping in for a quick bite after work. The staff were friendly, attentive and knowledgeable about the menu. This isn’t a restaurant trying to keep up with the latest trends, because it simply doesn’t have to. It serves great seafood and fish in a cosy, elegant setting. The ingredients are fresh and high quality, and the buzz of being a stone throw from theatreland means you never know who you are going to bump into either! This is a restaurant which is perfect whatever the time of day, day of the weekor month of the year. Jinjuu, Soho – A Cool Introduction to Korean Food!